Just a day after circulating several teaser shots for a new series Brian K. Vaughan and Martin Marcos whipped the comic book world into a frenzy by releasing the first issue. 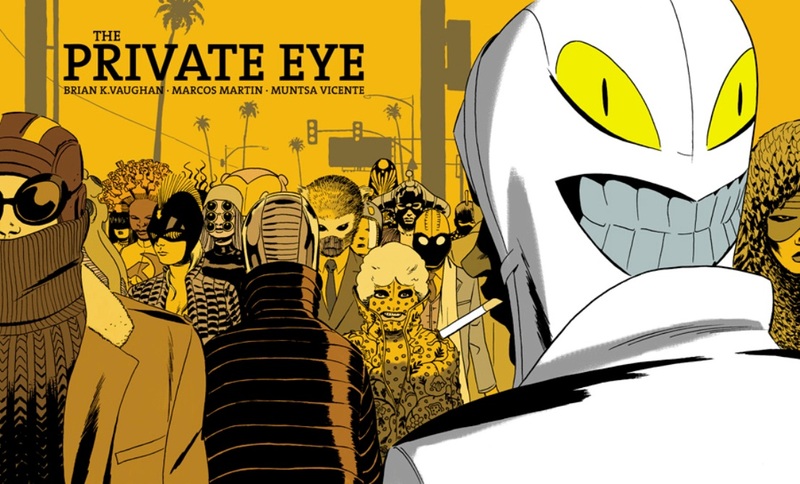 In what has to be the fastest teaser-to-release ever their new series, Private Eye, debuted on PanelSyndicate.com. They didn’t stop there, not only did #1 come out in record time but they also went with a name-your-price rate! That’s right in true Radiohead fashion you can pay as little as nothing to as much as you want for the first issue. The stipulation being if they raise enough funds with this issue they’ll continue the 10 part mini-series. Not giving the Internet a chance to catch it’s breath they also made the issue DRM-free (digital rights management). Meaning you own an actual file with which you can do with what you please. You can copy it, lend it to friend, and play it on any device you like anytime. Right now with a majority of the comic book digital files you buy you’re just paying for the right to read it on the hosting site. So you need an internet connection and if something such a bankruptcy to the host site happens you could lose all of your purchases. This DRM-free file is more like the equivalent of an mp3 you’d purchase off of iTunes or an audio book off of Amazon for instance. This is potentially a huge game changer in the world of digital comics. It will be very interesting to see if it affects the market in any way. Now after all that excitement did the story deliver? You’re darn right it did! In true Vaughan fashion we are instantly transported to an exciting new world. The story is set in the future where the internet has been eliminated and everyone wears masks to disguise their identity and thus their past. We are quickly introduced to the main character, a private investigator, who receives large sums of money to uncover who’s beneath the masks and the secrets they keep. In just 32 pages we are completely drawn into this inventive concept and introduced to a colorful cast of characters. Martin Marcos is given the task to bring this world to life and he more than delivers. His artwork is simply beautiful. He uses such crisp, tight lines and his attention to detail is phenomenal. Check out each panel individually and imagine the amount work that went into each background and setting not to mention facial expressions. Being a huge fan of cityscapes I particularly love page 5 which shows our protagonist jumping from a rooftop with a magnificent view of the city as a backdrop. Look closely at the panels featuring crowds and notice each individual distinctly wearing different masks. It is simply amazing detail work. Also on display is Marcos exceptional page layout skills. The layouts themselves are as unique as the story. His distinctive progression of panels really adds to the overall reading experience. He gets maximum use of the pages using creative arrangements without ever compromising the flow of the story. There is never any guess work when reading the pages on where to focus and when. Further enhancing the story is the brilliant color work by Muntsa Vicente. His vivid colors really make each panel pop right out of the screen. I particularly love when a colorist makes the distinction between night and day which is done perfectly in this issue. It makes the whole comic more genuine and alive. I absolutely love the colors used in the daytime park scene. This being my first foray into the world of digital comics I’d rate it as a positive one. Will it replace physical copies for me? I’d say no but that’s not to take anything away from this reading experience. I definitely hope this issue generates enough income so that the team will continue with this 10 part series. I for one am hooked on this imaginative new adventure and hope that one day it is released in a hardcover format. One final note I do find it ironic and humorous that it’s a story about the dangers of putting everything out on the internet yet it’s available exclusively through the internet. Hilarious guys!! Great review Stephen, i look forward to reading this. I pretty much adore anything BKV writes and this sounds so sweet. Couldn't agree more. I love the innovaton they're bringing to the industry and if as successful as I hope it to be, it could be a total game changer. Vaughan writes really great stories and I'm totally sold on the art here. (Keeping my fingers crossed that more comes our way). Nice job Stephen. I knew nothing of this before reading about it here and I'm interested to see what comes from the project. Funny how Vaughn, a guy who won't accept letters for the pages of SAGA unless they're hand written and mailed by snail, would make a comic that is only readable online. He's such a person's person. He has a way of talking to the reader like he's their friend. I admire his level of respect he has for his readers and for comics in general and I look forward to checking out this new series soon.